It is our mission for all hockey players to have a passion for the sport which will inspire them to continue to play or be involved in this sport well after they leave the school. We want all players to feel fulfilled and reach their potential. Players are to enjoy the competition, but maintain a sense of fair play and good sportsmanship, fitting of a SACS man. We have 12 teams who play fixtures against the other schools with the A teams in each age group involved in the Cape Town Schools League. Our coaching is of the highest calibre with South African International coaches and players heading up teams and nurturing talent from U14 level through to 1st Team level. Our school teachers also have a wealth of coaching experience, having coached South African school boy teams as well as Men’s Grand Challenge League level. Our coaches included Pierre Le Roux (SA Men’s Trainer); Craig Haley (SA men’s player); Wade Paton (SA Men’s player); James Peverley (WPCC Men’s 1st XI coach); Mornay van Zyl (past SA U17 coach and SA U18 selector). 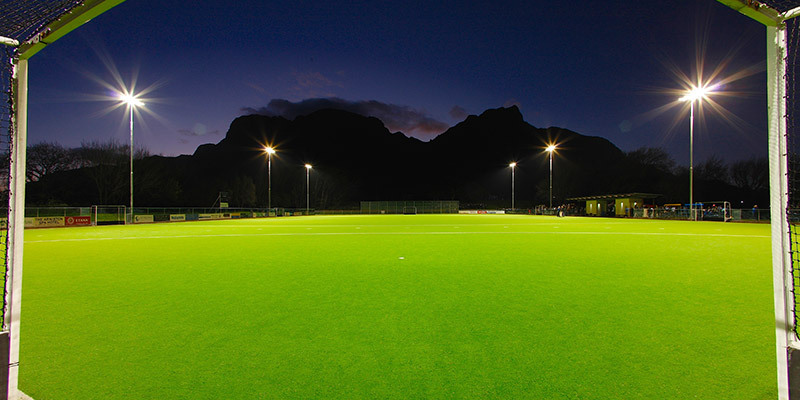 With addition of flood lights in 2014 the main fixtures are played on Friday evenings. This gives a great atmosphere to the home games; with hundreds of supports having wonderful views of the games from the natural banking that surrounds the pitch. This addition has also allowed all teams to have more practice time on the astro pitch. In 2013 SACS was rated by the SA Schools raking system as the 7th best in the country, rising to 5th in 2014. In addition, SACS won arguably the most competitive schools league in the country in 2014. We regularly have school boy representatives at SA level, provincial and zonal levels. Many SACS Old boys go on to play in the highest men’s leagues in Western Province. Teams from all age groups tour every Easter around the country and the 1st team also participate in the Cape Town International Schools hockey festival every July. SACS hockey is currently performing at an excellent level. The policies and coaching ensures that the standards are always being raised and are pushing the boundaries with innovative techniques and tactics. This allows SACS to perform very successfully against the very best of the hockey schools in South Africa, which include Bishops, Wynberg, Rondebosch (both home and away) and Paul Roos.